This resulted in the adoption of a card for Odd Fellows’ wives and widows. 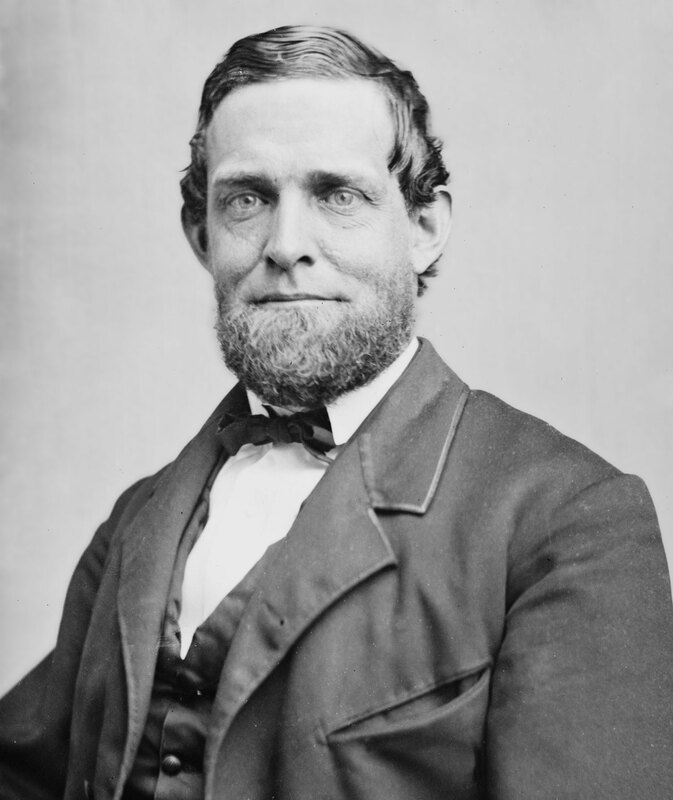 Among those who earnestly advocated the adoption of a degree for women was the Honorable Schuyler Colfax who voiced his sentiments in a minority report, so clear and logical in its argument that it was adopted and Colfax was made chairman of the committee to formulate suitable charges and lectures for the new degree. 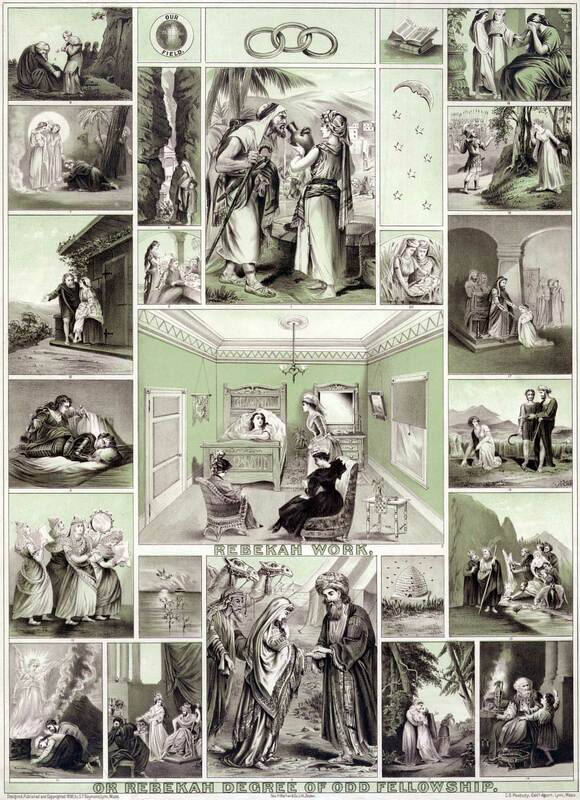 The work was presented in secret session in the city of Baltimore, September, 1851 and adopted. The law only provided for conferring the degree to and by subordinate lodges. It became customary for the brothers to designate a meeting at which the Degree of Rebekah would be given. The ladies met at some convenient place to wait until the brothers performed the necessary ceremony of opening lodge and were then escorted to the hall, received the lecture and charges and, if they had provided eatables, a recess was declared until the “inner man” was satisfied, after which the ladies were requested to leave the brothers to complete their work and close lodge. In the city of New Rochester, New York, the idea was advanced that it would be pleasanter and more interesting for all if, instead of the several subordinate lodges conferring the degree at irregular periods, a union degree lodge could be organized, to meet at stated time and do the work for all, bringing the several subordinate lodges together in a social way and providing some plan for the assistance of the ladies in the relief work of the Order. Such a meeting was called February 26, 1852. G. Henry Roberts was appointed special deputy for the degree and Monroe Union Rebekah Degree Lodge No. 1 was organized with George W. Perry, then deputy of the district, as Noble Grand. At this meeting the degree was conferred on twenty-two wives of Odd Fellows. At the second meeting, March 25th, thirty-three ladies received the degree. This organization has never ceased to exist. It held meetings once a month devoted to sociability and conferring the Rebekah Degree. The sister, although not eligible to office, took an active interest in the relief work and lent valuable assistance to the subordinate lodges in caring for the needy and distressed. This organization was bitterly opposed by many. It was declared illegal and memorials were sent to the Sovereign Grand Lodge asking that it be abolished. The report was adopted by a vote of 69 to 28. Monroe Union Degree Lodge and its friends had triumphed. The head of the Order had endorsed its methods and at the following session of the Grand Lodge of New York it was chartered as Monroe Lodge No. 1, Degree of Rebekah, dropping the work union from its title. During the interim between the meetings of the Sovereign Grand Lodge and the Grand Lodge of New York several other jurisdictions had held Grand Lodge sessions and took advantage of the privilege of instituting Rebekah Lodges. Notable Iowa and New Jersey, both of whom claim the oldest Rebekah lodge. But while old Monroe did not receive her charter until early in 1869 she had been meeting regularly and working earnestly since first organized in 1852. The growth of Rebekah lodges and membership prove the ability of woman to grasp the real meaning of fraternity and carry the principles of Odd Fellowship into practical, every day life. Late statistics give the numerical strength as 4,796 lodges and 297,691 members. State Assemblies have been organized in forty jurisdictions. The work of building, furnishing and maintaining Homes has found its staunchest friends and most enthusiastic advocates among the Rebekahs. Progress and prosperity mark their efforts and “Excelsior” is their watchword.